From I-20 take exit #183. Left on 221N Appling GA. Go 4.2 Miles at the stop sign go straight onto Ray Owens rd, go 8.5 miles Turn Left onto Rt 47W. Go .8 miles turn right into Pointes West Resort. Follow signs to the lodge to check-in. RV parking to the front of the lodge. Required. 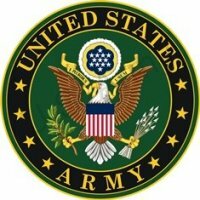 Active duty may reserve 180 days out; all other authorized users 150 days out. Free WiFi in lodge. Weak cell phone coverage. Stay policy is 30 days in, then at least 30 days out before you can return. Dump and water available at campground. Visit Pointes West website for details on rentals. Seniors and Disabled Vets get about a 33% discount on FHU sites. RV/Boat storage, Outdoor equipment rental. Allowed, but must be kept in your car or RV. A full featured recreation facility. Spread out along the shores of Thurmand Lake. Plenty of picnic and camping areas. Great fishing! This is a beautiful campground! 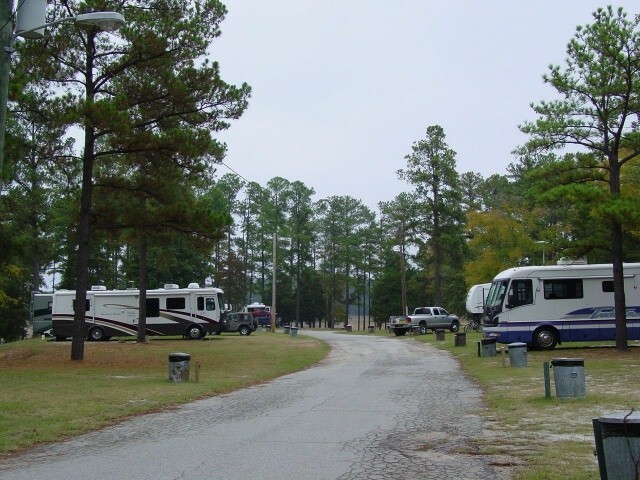 It actually consists of multiple small camping areas, including an RV park which has rental campers and a few additional open sites (which appeared to be pull in, back out judging from the position of the hookups). Each Area is located on the water: there are dozens of small peninsulas where sites can be positioned to get good views all around! Not all areas have hookups, however. We noticed that some Areas had concrete tables; some even had concrete patio pads. The main roads are asphalt, with gravel/dirt driveways into camping areas. We were in Area 4 which seemed a little more worn than some of the other areas. It was relatively small (maybe 12-15 sites?) so would be an nice setting for several families camping together. We were in the only pull-through site -- which was right on the roadside leaving little "yard" area. There was a fire ring, grill and picnic table (wood picnic tables had seen better days) but the steep bank made it difficult to get the picnic table level without it being right up against the camper. Also could not see the water views from the front side of the camper facing the road and had to set up our chairs on the "sewer" side of the rig. Area 4 was also a little difficult to maneuver through for larger rigs since the road was a fairly tight circle with steep entrance. Most campers in that area appeared to be around 30' or so, pull behinds. We did see one motor home on the roadside site (which was a little larger than the other sites). There appeared to be some washout of gravel further down into the sites and I wondered if there may have been some earlier flood damage. However, we had full hookups with everything working as it should, grass was cut and area was clean with trash cans at each site and trash pickup. For the price, it was still the best deal around but you may want to check out some of the other areas. 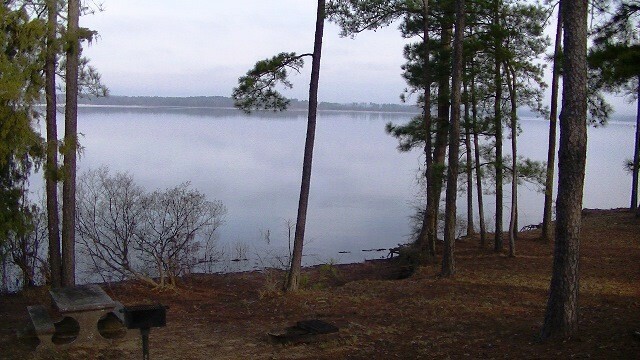 The overall landscape has lots of open shore areas (no swimming signs posted) for fishing, etc. and the wooded areas have been thinned out so there are plenty of spaces for walking. 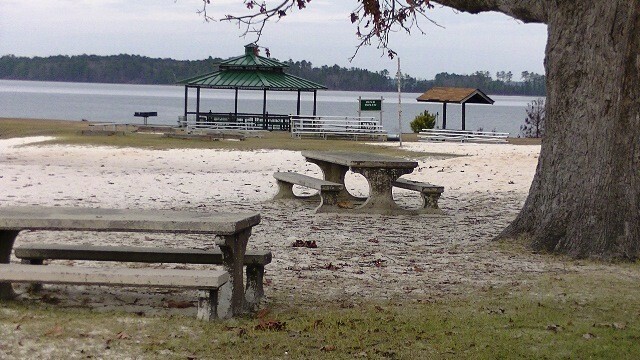 Also picnic areas scattered around were nice. 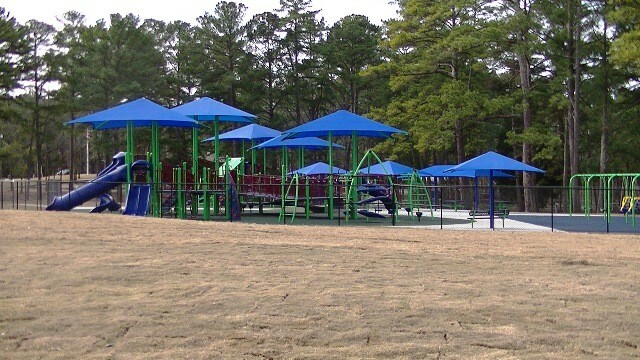 Conference center, playground, marina, picnic shelters and green areas were new looking and all well maintained. There is something for everyone here and little towns located within 15-20 minute drive. The guard house was unmanned and we were never stopped or asked for ID other than at check-in (at the Lodge as one enters the resort). If you are a water lover, this is the place for you! Gorgeous views, with places for your boat (and storage area for your camper). Bottom line: It is a great value at the price given; with the additional senior discount, it is a steal! Lovely campground, but some tight back in, hilly sites. We paid $14. a night (access pass) for FHU back-in site 4A. Larger rigs seem to be in area 2, but they are still back in sites. Great lake views, nice and quiet. Was able to get direct tv but there are also about 10 OTA. Laundry (2W/2D, 50 cents each) still overflows, they even ask you to space out starting times for wash. Very family friendly, lots of playgrounds. Cabins, motel, tenting, rv, rental rv's - it's all here. 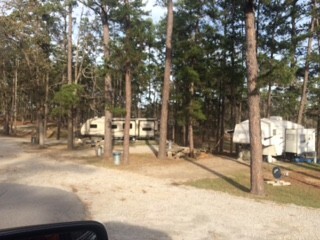 This campground has everything you need for some down time, location a bit off of hwy 20 but sometimes that is the idea. This was our first visit to this resort. The area was very nice. We stayed in one of the cabins which had a large deck over looking the lake. The cabin had two bedrooms and one bathrooms which we had to share. The TV in the cabin was very small, I wish it could have been bigger. Overall we had a wonderful time and will be back for our anniversary in March 2017. Well I came back. Its still one heck of a place. Location Location Location! asked for spot in campground 4 and 7. my son and a friend wanted to tent camp and these two areas are close to each other. In campground 4 I found another beautiful spot. It appears that the grounds keeping and maintenance staff have been steadily working since my last visit. It is noticeable and appreciated, these folks work hard to keep this place in working order. I had very good time, checkin easy no problems. will be back. If you are in this area of GA or SC, you should stay here. This facility is full of contradictions. At first look its a fantastic park. The Staff is more than helpful. I was initially assigned a spot in campground #2, I arrived just minutes before the office closed and checkin was done without any problem, front desk very polite. I went to my site, found two large holes in gravel pad, appears that a dully dug up the area during a particularly wet time. the pile of disturbed gravel and the holes combined would make it impossible to get in the site. I returned to the office after they had officially closed but before anyone had actually left. I explained my problems with my site and requested another. The Staff individual sat down and found me an alternate site, He went over and above what I have found at other places after closing. The alternate site was a pull thru and its location is fantastic, I could not have asked for a better site. Now the bad. bath house, looks great is new, but not well maintained, only one of the two showers had a shower head. NO HOT WATER. mud dirt and mold visible. Laundry, only 2 washers and 2 dryers, room is moldy has been and in fact did flood while washers in operation. so poor pluming, drainage, and /or up keep. It appears that the ARMY spent considerable funds to update and set up this camp, but then did not provide the resources to maintain it properly. So appearance 5 stars, this is a beautiful camp. Helpful office staff 5 stars, they could have told me to bad we are closed but did not, instead they worked out a solution that was better than the original. Amenities and facilities 4 lots of new construction but not much upkeep. Will be back, have already reserved spot for next Month. Site 4A - beautiful area, on a lake. Agree about signage for check-in - especially when you get into resort area. Approximately 30 miles from Fort Gordon. About 15 miles from restaurants and grocery store. Check-in was very easy, staff pleasant. 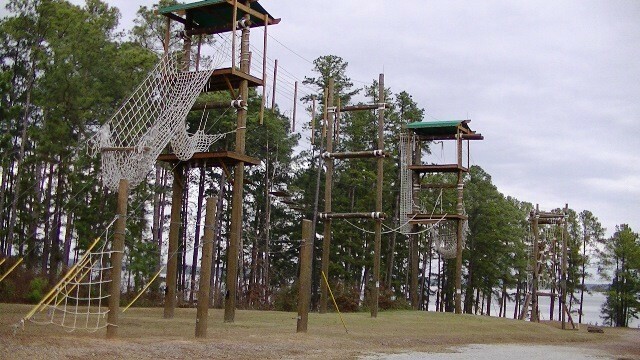 This is a beautiful resort for the military and their families. 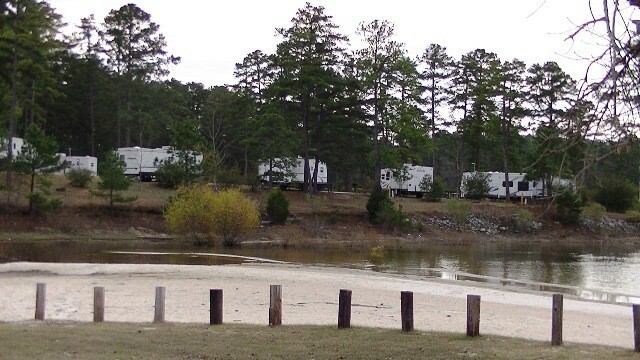 There are tent and rv sites, cabins, etc. The RV sites are nice for gravel sites. No cable, but we were able to pick up several channels with our antenna. There are some RVs that definitely appear to have been here longer than the 30 day limit stated in the rules (one right beside us that no one was staying in while we were here); if the resort would clear these campers out it would look a lot nicer. The one next to us was very mildewed and tool box, fishing stuff, etc were laying out at the site. Upper end of Area 4 had sites that were very tight. We were told the park is working on making Area 2 pull-through sites. We stayed here in a motorhome with a tow (which we had to unhook before backing into site). Paid $14 per night. We will definitely come back here for a longer visit. Recommend Armondo's in Evans - very good Italian food (in shopping center with Publix grocery store). Role reversal: I usually praise a place that other folks bash. I’m going to be the curmudgeon here even though I’m giving it a 5. Of course the price is fantastic so I shouldn’t complain. Guess my expectations were built too high when we saw how fantastic the drive into the park was. Beautiful buildings and grounds. Amazing playground. Fantastic lake views. But then. How many reviews does it take for them to realize that they need to put a dang sign up indicating the check-in place? The parking lot for the hidden check-in place is striped for cars, not RV’s! Not a problem for us because it was empty but I could see where this could be an issue on a crowded weekend. BTW, I may be the first reviewer since they paved most of the main roads in the CG. They did a great job and it looks fantastic. And then the RV sites. It looks like they blew all the money on the rest of the park and didn’t have a dime to spend on sites that generate revenue. The pathways into them are confusing. It is crushed, not well maintained, stone. There is no direction…you go in any old way and in some areas it is hard to discern where the “road” is. Definitely stop on the paved road and do a foot reconnaissance first. And, many/most of the best sites are occupied by long, long termers and/or hosts. There are no signs indicating they are hosts but they have golf carts. Many rigs were never occupied while we were there and looked as if it had been awhile. That’s the constructive criticism. The good, and there is it a lot of it, has already been covered in other posts and we experienced that too. Very nice folks and beautiful views. The hookups are great once you get into the site. Verizon worked well for us. Not many satellite friendly sites but there are a few. They are great about letting you find a site that you like. We’ll be back if I’m not on the blacklist after this. PS: there was a sign at check-in saying that DOD was requiring these type of MWR facilities to charge more in-line with comparable civilian rates. As a result, they will raise rates starting 1 Oct. I asked how much and was told about $2. Not much but wonder if this is just the nose of the camel under the tent. Very nice and quite place. The staff is super friendly. I stopped there on a trip through the area to check it out and made a reservation then. Upon offering to show my retired military ID card to the staff lady, so said that because I was retired that the fee was only $12 per night. WOW! I already thought the $18 fee was very reasonable. Really enjoyed the beautiful lake and area. The 4 star rating for amenities is due to no cable or WIFI. There also is only 2 washers and 2 dryers. Had reservation for April 15-18. Our schedule allowed us to arrive two days early so I called and they were very accommodating to allow me to arrive early. Be careful with the directions to the park. Take exit 183 off of I-20 and go north. Once you turn left on SC Hwy 47W, the entrance is just past the convenience store/gas station on your right. The directions should say 8/10 and not .8 because we missed the decimal point and saw the entrance too late to make the turn. Had to go several miles to find a turn around. Also, once you enter the park, there is no signs to the lodge. Just follow the sign to the beach and it will take you past the lodge. Plenty of parking at the lodge to register. This park has lots of trees so I wanted to have a site that I could get satellite service. Upon my arrival they gave me a list of sites that were available for my time period so we drove around and found one that would work. Even though the park is some distance from any town, we were able to get antenna TV service from Augusta. Many sites had RVs that were not occupied and other RVs that were park rentals. They must allow sponsored guest because our neighbor and four other sites were guest of the same military member. I know this brings in revenue for the park but they had some of the better sites. There is a small camp store at the lodge for any basics that you might have forgotten. They will give a refund if you decide to leave early. Good Wi-Fi service at the lodge only. Good Verizon service in the park for phone and internet. Don’t forget to ask for the retired/senior discount – instead of $18/night you pay $12/night. What a deal! Would definitely stay here again. 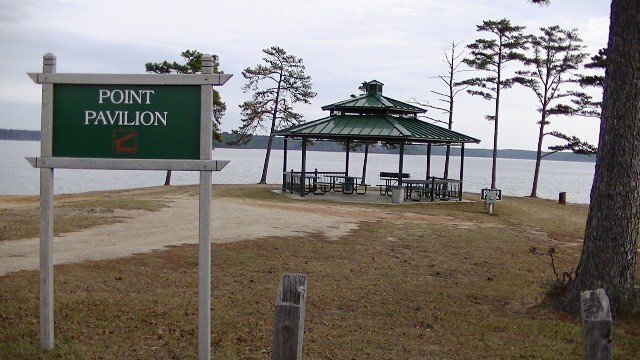 We love this place, though we come here to visit our son who is stationed at Ft. Gordon, it offers a relaxing setting, great fishing, a short drive 25 mi, into Augusta. We also like the other sight seeing things like, the Laurel and Hardy Museum, Atlanta is 120 mi etc. etc... The lake is very, very, full right now at peak, maybe a little over, but we have seen it just one year ago at 17 feet below its rim. Mgt is beginning several improvement projects on this peninsular resort including boat dock improvements, road resurfacing, and others. 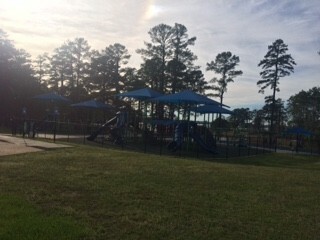 They just finished a brand new children's play area and upgrading the wifi to other areas just not all of the RV spots. NOTE: Follow the above "new" direction EXACTLY ! ! ! We wish more military parks would follow this ones example of pricing and length of stay or rotations. It was terrific to meet for a few minutes with Larry F. while here, he and Connie are terrific people. They are energetic and ethical, it's no wonder that this site is as successful at it is. They are driven! We arrived planning to stay a few days. This time of the year, the area was quiet and calm. We decided to extend a couple more days. 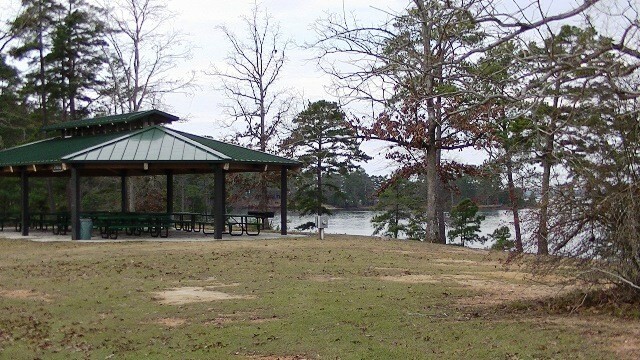 Very nice recreation area, with plenty of picnic and camping sites spread out. While not a fancy RV Park, it is a great outdoor recreation area. We had some problems fitting our 40' motor home into the site assigned, but they gladly let us move to another site nearby. I agree with other posters that they could have a couple signs along the entrance road pointing to the lodge. We easily found the lodge, but did start wondering if we had passed it. The lodge isn't near the entrance gate. Everyone working here was fantastic and very kind. We got the senior discount, which makes this a fantastic value. We wish all military campgrounds were fair on their pricing like here. A little out of town, but located on a beautiful lake. Great for this type of camping. Pointes West Recreation Area is on our list to return to! Our only comment is the registration site ought to have been more clearly marked by signage. It took us awhile to locate the office to sign in and be directed to our previously reserved camp site-! 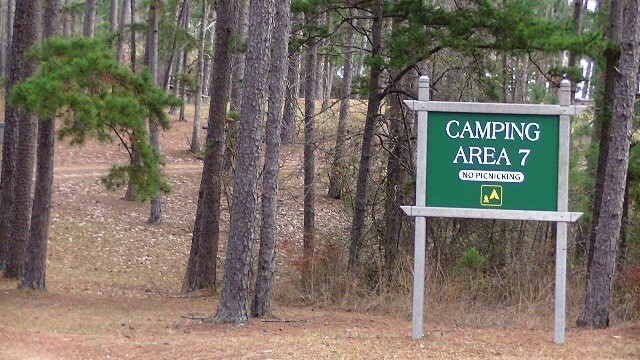 Perhaps like Ft. Benning where they have indications on the entrance sign to the campground? This was our first camping trip with the new pop-up trailer. 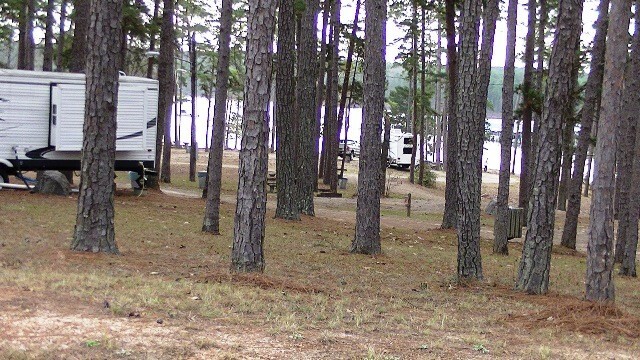 We stayed in Area 6 and enjoyed a great view of the water and the shade of the tall pine trees. The trash can at our site (6F) was collected each morning throughout our stay and the area porta potti was immaculate enough that my wife was willing to use it, and she is a very harsh critic in that area. The $7 sites have power in the form of four 110V outlets protected with two 20A circuit breakers mounted on the telephone pole that the power comes to the site on. I was able to successfully run my A/C and fridge all weekend without issue, but was careful to turn off the A/C before running the coffee pot. 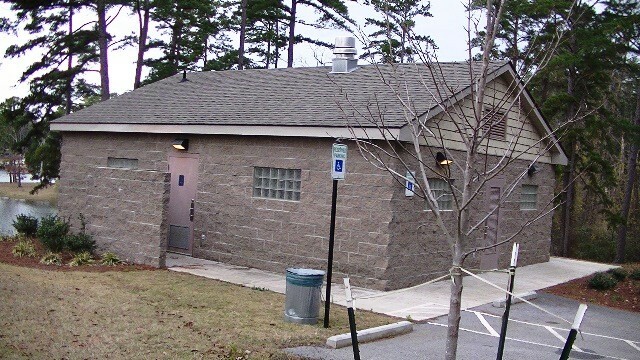 The lodge and the permanent restroom/shower facilities were about a mile from Area 6, which is the farthest away from them. There is a small convenience store in the main lodge which has beer, ice, and a hotdog/sandwich window. There are two washers and dryers available and are 50 cents each. Kayaks, Canoes, John boats (no engine, just oars) are available for rent as are many camping items such as lanterns and sleep mats. They do have bikes for rent but they are stored outside and are in pretty rough shape unfortunately. We were a little disappointed that on such a great lake the MWR did not have any motor boats for rent like we have seen at many other facilities. 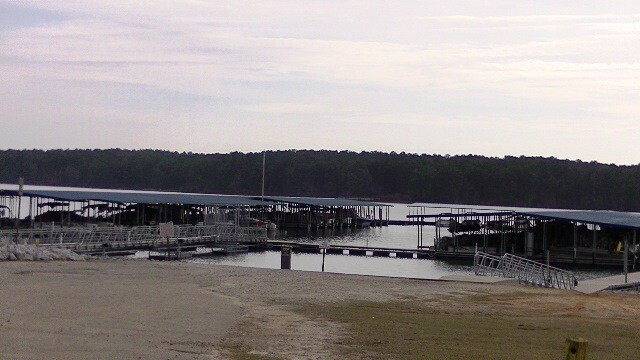 There is a great covered slip marina associated with the camp ground as well though we did not use it on this trip, as experienced boaters we were impressed with the set up. Overall we had a very enjoyable time, even making a trip to the Evans Center Dog Park at the recommendation of a family from the local base who was out camping for the weekend, much to the delight of our dog. We will definitely be returning soon! We had two weeks booked here beginning 3 June. Unfortunately, we left without staying because the sites in the section we were assigned to (section 4) were infested with ants .... teeming with them. The campers in the neighboring site indicated that the ants were getting into their trailer and truck. If you go, be prepared with ant spray and bait. We were prepared, but the area to be sprayed was too big ... work more suitable for a maintenance crew with a commercial sprayer. I don't know if every section has a problem, but the other sites that were offered to us as alternatives were too small, so it was a moot point. They refunded our camping fee, but would not allow us to boondock for a night in the oversized parking lot across from the lodge (it was around 6:30p by then) while we tried to make alternative plans. We drove 20 miles to Grovetown and overnighted in the Wal-Mart parking lot instead before moving on to a private RV park the next day. The young woman at the Whispering Pines Lodge at Pointes West where campers check in was very nice, and she understood why we opted to leave. They even ran out with the mail we had forwarded here, which arrived just as we were leaving. For that, they get 4 stars for hospitality. The four stars for location is based on the site we would have stayed in (had the ants not interfered) as it overlooked the lake. The 1 star for amenities is because we didn't use any of them and can't rate them. Would have been good value for the money had we been able to stay. They could also use better signage to the lodge for first-time visitors ... if you go, continue towards the boat ramp/picnic area and not towards the campground to register. If there was a sign for Whispering Pines, we missed it. We stayed three days and got a great campsite. We were right on the water and had a campfire. The staff had cut firewood stacked nearby which was a nice touch. 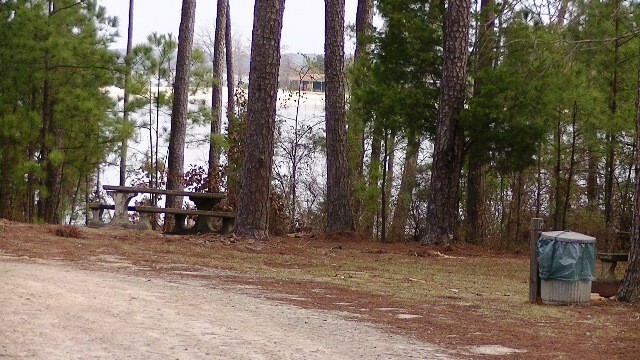 The campground had been recently mowed and the grounds were in great shape. The lake was down but we saw a few boaters and fishermen and saw a guy catch a big one 100 yards away. The laundry is good although it is ways from the campground. Plenty of parking and a good turn around point for checking in before heading to the assigned campsite. My Verizon Mifi worked fine. My AT&T did not work. 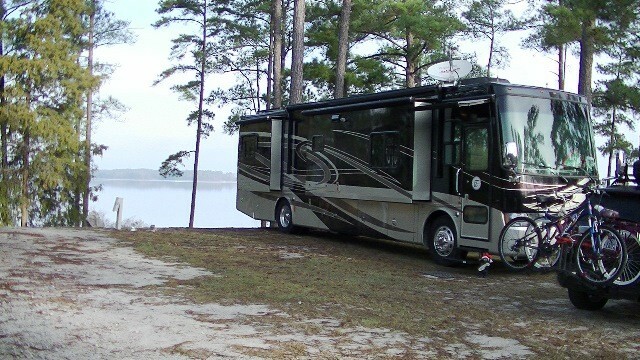 The campground is 35 miles away from Augusta and Fort Gordon so it takes a while to get there. We went downtown to the Visitor Center and played golf at Fort Gordon one day. The golf course is a real gem and was in great shape. We camped in a 40' MH. We have stayed here several times, and it is always a great time. The management of this facility should be commended, as well as the staff. Upon our arrival we were greeted by Crystal James and although she was very busy with many customers, she was polite, efficient and very helpful! The lake is down but not much the camp can do about that! The only thing I have to say is that the sites were crammed in a little close for my liking. For the price I can't complain to much. I enjoyed the stay while mom and daughter were prepping for the wedding in nearby Thomson. Overall nice place but wish they would get lots of rain to fill the lake back up to its original levels. Stayed here 5 days. Very quite and relaxing, Water is everywhere. 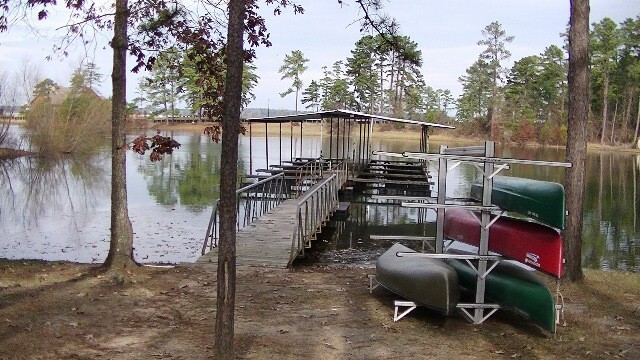 Has a small beach for swimming in the lake, fishing, & walking trails. Had water, electric, & sewer hookups at our site. Direct TV, Verizon cell & Internet worked great. Paid $ 12.00 per night. Campground in not on base, but not far. Also not far from other shopping and dining out. I don't consider 15 miles far. Has a small store at campground, basics only. Had laundry at campground .50 wash & dry, and it still leaks. I'm not a numbers rater, either I like a FamCamp or not. Well I like this FamCamp. Will stay here again. R.M. left this review using the Directory software: - The laundry facilities (2 washers & 2 dryers) at 50 cents each; however wear flip flops as the washers overflow water all over the floor. Had a real good stay on our first attempt at RV'ing. Rented canoes for $3 an hour, had a fire ring and lots of firewood available. We had a full hookup at the site, and the kids could walk down and fish from where we could see them. They didn't catch anything, but that is probably just using the wrong bait. No cell phone 3G service (did get AT&T EDGE, so it was a bit slow, but doable). It is a bit of a drive if you want to get something to eat or go to a grocery store. The staff was very helpful and we were pleased with how well the site was kept up.